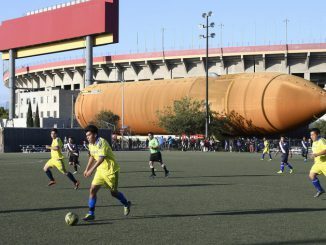 A spectacle never seen before — a space shuttle external fuel tank traversing city streets — was witnessed in Los Angeles on Saturday as the relic was moved to the museum that will construct a rocket science attraction. 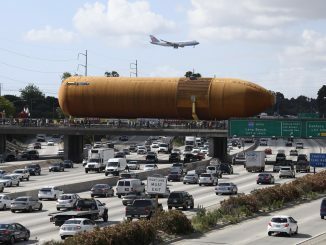 A last-of-its-kind piece of space hardware — the only remaining shuttle external fuel tank — makes its way along the city streets of Los Angeles to the California Science Center. 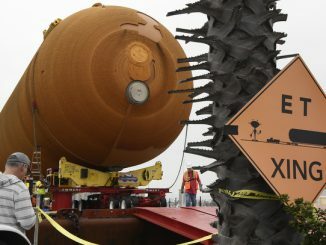 A five-week, 5,000-mile sea trek of the last space shuttle external fuel tank pulled into port today for a parade through the urban jungle of Southern California on Saturday to its final destination. 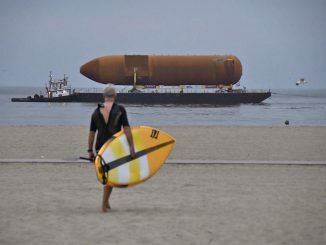 The museum-bound space shuttle tank is coming ashore this morning in Marina del Rey, California, for offloading from its transport barge. 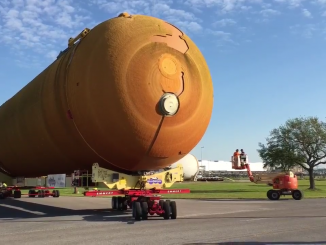 Making a brief pit shop in San Diego to clear customs today, the museum-bound space shuttle external fuel tank will reach Los Angeles for offloading from the transport barge on Wednesday, just days after a serendipitous rescue of the passengers from a sunken boat in the Pacific. 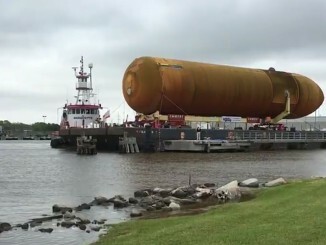 The last space shuttle external tank in existence, headed from the New Orleans manufacturing plant to the California Science Center for the vertical launch pad display of the retired orbiter Endeavour, has passed through the Panama Canal. 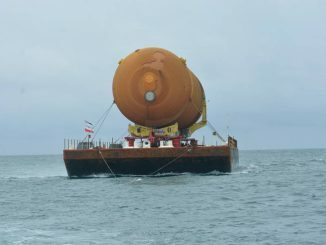 Navigating the 48-mile Panama Canal that slices through the isthmus, the final shipment of a space shuttle external fuel tank emerged into the Pacific for a three-week trek to California. 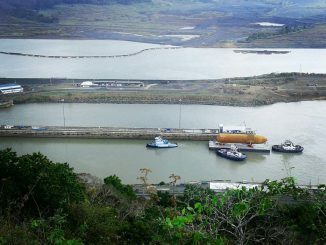 The tugboat and barge transporting the last space shuttle external tank to its display venue in California have reached the inlet to the Panama Canal, now just days away from sailing into the Pacific. 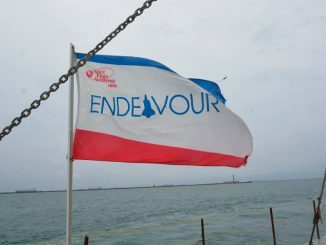 On the 35th anniversary of the first space shuttle launch, the last remaining external fuel tank set sail today from its factory in New Orleans to Los Angeles and a remarkable museum attraction in the making. 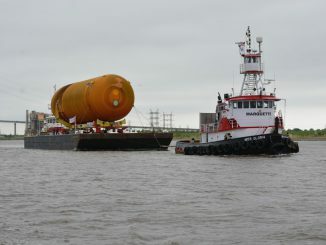 The last remaining external fuel tank built for the space shuttle program but never flew will depart its factory in New Orleans on Tuesday for a long sea voyage to the California Science Center in Los Angeles.